Guest Column: Will Egypt become a totalitarian state? Note: This column originally appeared Dec. 26, 2012 on the website Mercator.Net. The Muslim Brotherhood has made another giant step forward in consolidating its rule in Egypt through the successful passage of the newly drafted constitution by some 64 percent of those who voted. Next come the parliamentary elections in two months through which the Brotherhood will regain control of the legislative branch. In the interim, it has stacked the upper house of Parliament, called the Shura Council, with its own members who will have the power to legislate until the new lower house is elected. President Mohammed Morsi has already successfully decapitated and made peace with the powerful Egyptian military. The new constitution has given him the power to purge the Supreme Constitutional Court by reducing its size from 18 to 11 members. The president of the Lawyers' Syndicate, Sameh Ashour, pointed out the goal: "These are monopolistic plans. The Brotherhood wants to control all aspects of the state." In other words, this will be a clean sweep. Why worry? Isn't Islamist democracy just a step on the way to democracy as it is understood in the West? Isn't that why the United States is supporting Egypt, and why the US administration has courted the Muslim Brotherhood since President Barack Obama seated its members in the front row for his famous speech in Cairo in 2009? Isn't this all part of the Arab spring? The novelist Saul Bellow once wrote that, "A great deal of intelligence can be invested in ignorance when the need for illusion is deep." To maintain the illusion that the Muslim Brotherhood is intent on transforming Egypt into a democracy requires the application of considerable ignorance. The Muslim Brotherhood was founded in 1928 in reaction to Kemal Ataturk's abolition of the caliphate in 1924. Its ultimate aim is to restore the caliphate. Its vehicle for doing so, according to founder Hassan al-Banna, is a one-party system akin to that of the Soviet Union under Stalin. Al-Banna envisaged a bottom-up strategy in which people would be Islamized at the local level first. For this purpose, he created his party. After winning the masses, the Muslim Brotherhood would take total control. Why is total control necessary? The chief ideologue of the Muslim Brotherhood, Sayyid Qutb, wrote that, "Islam chose to unite earth and heaven in a single system." What does this mean? It means that the separate realms of the divine and the human have collapsed into each other, and that it will now be possible, as Qutb said, "to abolish all injustice from the earth." This, of course, is a millenarian vision similar, in many ways, to the Marxist dream of creating a classless society based on the abolition of scarcity. If perfect justice is to be achieved here, rather than before God's throne in the final judgment, several things will be required by those who institute it. They will, in fact, need the very same things that God is thought to possess in his ability to achieve perfect justice. Those two things are omnipotence and omniscience. The omnipotence will be gained through the establishment of a totalitarian regime. The omniscience will be obtained, as it always has been in totalitarian regimes, through an extensive secret police apparatus. What does the Brotherhood's version of Islam look like in this scheme? As indicated above, it does not look like a normal religion, which preserves the distinction between the earthly and the transcendent. It is a revolutionary ideology aimed at the total transformation of reality. Here is its view, as expressed by the de facto spiritual head of the Muslim Brotherhood, Sheikh Yusuf al-Qaradawi: "Islam is a comprehensive school of thought, a creed, an ideology, and cannot be completely satisfied but by [completely] controlling society and directing all aspects of life, from how to enter the toilet to the construction of the state." However, some analysts suggest that, since its founding 84 years ago, the Muslim Brotherhood has evolved and, when in power, will evolve even more. This is always the hope of those who fail to recognize the essentially totalitarian nature of certain political movements and principles that are not subject to change. Similar hopes were expressed about the Nazi Party and various Marxist parties. They would mature in power, the exercise of which would transform them in a moderate direction. This, of course, did not happen, though these parties often fostered the impression that it was. Rather, these widely held illusions actually enabled these totalitarian parties to consolidate their power. 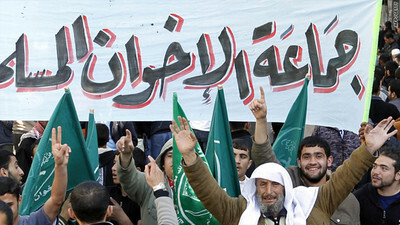 The Muslim Brotherhood is a hard-core cadre party. It takes eight years of training to become a full member. Let us listen to the Brotherhood's leadership today concerning its mission and its prospects of changing. The Deputy Guide of the Brotherhood, Khairat al-Shater, said: "The mission is clear: restoring Islam and its all-encompassing conception; subjugating people to God; instituting the religion of God: the Islamization of life, empowering of God's religion; establishing the Nahda of the Ummah [Muslim nation] on the basis of Islam." As for change, al-Shater proclaimed that, "no one can come and say: 'let's change the overall mission'… No one can say, 'forget about obedience, discipline and structures'… No. All of these are constants that represent the fundamental framework for our method; the method of the Muslim Brotherhood. It is not open for developing or change." So, this is where Egypt is now headed. Some, such as Alber Saber, 27, who was accused of blasphemy this past fall, say of the Brotherhood, "They are no different from the former regime. The weapons have changed, but they are both oppressive regimes." He might very well wish this were so, but it is common experience that authoritarian regimes are considerably more limited in their reach and cruelty than totalitarian regimes. They wish to maintain power, but do not have the metaphysical ambition of transforming reality. This, in other words, will be worse than Mubarak. Sudanese writer Al-Hajj Warraq, got this exactly right in an Egyptian television interview earlier this year: "Democracy is about more than just the ballot box. Democracy is a culture engraved upon the cerebral box before it is the ballot box. One cannot talk about freedom in the absence of free minds. The tragedy of the Arab Spring is that when the tyrannical regimes fell, the fruits were reaped by movements that preach closed-mindedness, rather than free thinking. The outcome will be regimes that are worse than those that were toppled." As indicated earlier, totalitarian regimes, before achieving total control, can display considerable tactical flexibility. When the economy of the Soviet Union was near a state of collapse in the 1920s, Vladimir Lenin had no trouble in instituting a limited free market New Economic Policy, which was later revoked once the danger had passed. The Soviets were expert in creating the impression that they were changing in some fundamental way in order to gain aid from the West to save the revolution. The Muslim Brotherhood has already displayed this kind of tactical dexterity through its use of democratic rhetoric and elections to gain assistance from the West and to lull its opponents. As the Islamist Prime Minister of Turkey, Recep Tayyip Erdogan once said, "democracy is just the train we board to reach our destination." Displaying this kind of flexibility, Sheikh Yusuf al-Qaradawi, suggested that Islamic law, sharia, should be implemented gradually in Egypt: "I think that in the first five years, there should be no chopping off of hands." One must prepare the ground first. However, the final destination has been clear from the beginning. Brotherhood founder al-Banna announced: "it is the nature of Islam to dominate, not to be dominated, to impose its laws on all nations and extend its power to the entire planet." Stop the train: I want to get off.